Interested in purchasing a new Amish-built barn, shed or cabin for your property? We strive to provide a diverse selection of durable outdoor structures that can meet the unique needs of each of our customers. We understand that these high-quality structures can be prohibitively expensive for customers on tight budgets, however, which is why we offer a convenient rent-to-own option on many of our buildings. 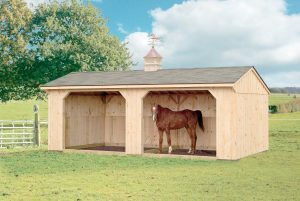 This option is available on all single-wide, single-story buildings up to $10,000 and gazebos up to $6,000. Our rent-to-own plans require no credit check and have no early payoff penalty. These payment plans also include a 90 days same as cash guarantee. This means that as long as you pay your purchase off within 3 months, you won’t pay a penny in interest. Best of all, it only takes a few minutes to apply. To get started, you can fill out the rent-to-own application on our website. All you have to do is tell us what you’re looking for and provide us with some basic information to verify your identity. Once we’ve reviewed your application, we’ll reach out to you to let you know whether or not you qualify for our rent-to-own option. If approved, you can also sign up for our paperless autopay option so you never have to worry about missing a payment. Have any additional questions about the rent-to-own payment plans we offer at Amish Barn Company? Feel free to give us a call or contact us online today!